Daniel Johnston Dan is our scientific and intellectual leader. Although his administrative duties have put serious demands on his time, he remains intimately involved with all aspects of the various research projects in the lab. He always has time to offer valuable suggestions and comments to all of us. Rick Gray Rick has been part of Dan’s lab for a long, long time (He still has vacuum tubes for a Tektronix 502 oscilloscope in his desk). He’s interested in all aspects of the modulation of electrical activity in neurons. You can read more about his research, and his other science-related and personal interests on his webpage. Randy Chitwood Randy is interested in synaptic integration and plasticity in the input and output regions of the hippocampal formation, specifically the entorhinal cortex and subiculum. He is currently investigating the mechanisms of activity-dependent changes in both synaptic function, and intrinsic excitability in principle neurons of these areas. Darrin Brager Darrin is interested in the cellular mechanisms that regulate synaptic plasticity and intrinsic excitability. 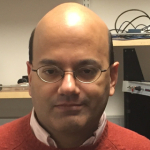 Currently, he is investigating the role of postsynaptic ion channel modulation in physiological paradigms of learning and memory and animal models of epilepsy and autism. Chung Sub Kim Chung Sub joined Dr. Daniel Johnston’ s laboratory as a Ph.D. student in 2007 and received his PhD in 2011. His current research is to investigate the cellular and molecular level of HCN1 channel in the hippocampus. He is using lentiviral-shRNA system to manipulate HCN1 channel in vivo. Niraj Desai joined the lab as a research scientist in 2012. Speaking broadly, he has two distinct but related interests: (1) understanding the rules of neural plasticity, both synaptic and intrinsic, and how these rules allow neural circuits to function and adapt; and (2) bridging the gap between cellular neurobiology and systems neurobiology. Speaking precisely, he obtains whole cell patch recordings from awake behaving mice, in hopes of describing how the activity of prefrontal neurons contributes to working memory. Elizabeth Arnold Liz joined the lab as a grad student in 2013. She is interested in modulation of intrinsic excitability in epilepsy. Jennifer Siegel. Jenni joined the lab in 2013 and uses single neuron recording methods in awake behaving animals and anatomical tracing to determine how the prefrontal cortex interacts with other brain regions to support learning and memory and executive function. Brandy Routh Brandy joined the laboratory in 2006. She does some experiments, publishes a paper, then takes time off to have a baby. She’s repeated that sequence once more; we’ll see if she returns to the lab again.